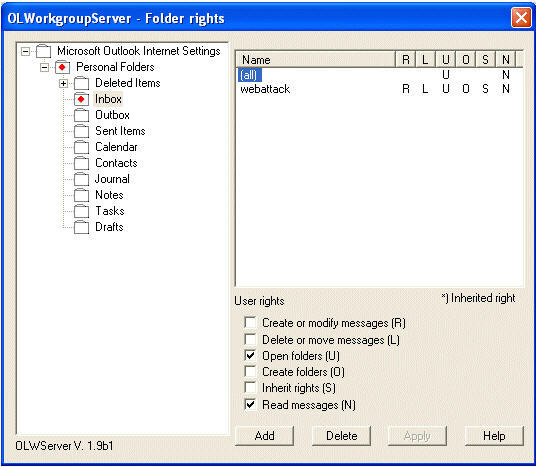 OLfolders is the ideal solution for sharing Outlook in a network. OLfolders for Outlook enables the multi-user real time access to all Folder in Outlook via a network connection. Share contacts, emails, tasks, calendar, journals and documents in in Outlook without installing a dedicated server such as the Microsoft Exchange or Lotus Domino/Notes. One or more computers act as a server, allowing other computers reading and writing Outlook elements via a network connection. Because data is not synchronized but shared, all changes are visible by all users immediately. For offline use, synchronization can optionally be done for certain folders using QSynchronization. Each user can be configured to have different access rights, files, folders, elements can be hidden or write protected. Each user can be configured to have different views to folders, for example the same contact folder can be displayed for user A as telephone line, for user B as address cards. The integrated mail server submits internal emails without an active internet connection and manages external mails. The server is able to store incoming mails directly into a data file. A shared file can be used for mail transport allowing more than one user sharing a mail account. A mail filter filters most viruses and spam emails. Concurrent access to shared folders with 2 until 250 users via a network connection. Central data storage at the server. Sharing of contacts, emails, journals, tasks, appointments, user defined forms. Server runs on all windows versions from Windows 95 to 2003 Server. Server runs as service or as program. Each user can configure personal views to folders. Mail transport to shared folders or to personal folders.